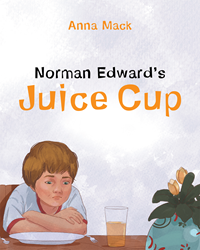 Recent release “Norman Edward's Juice Cup” from Page Publishing author Anna Mack is a whimsical children’s story every child and parent can relate to. Anna Mack, a devoted writer and author, has completed her new book “Norman Edward's Juice Cup”: an entertaining children’s book that was born out of the observations of her adventurous youngsters. Anna Mack was born in Upstate New York. She spent her childhood exploring the creeks and meadows around her home with her many siblings. After obtaining her nursing degree, she traversed across the United States to live and work in Southern California. In most recent years, she has spent her time in Northern California raising her own children with whom she shares her love of the outdoors. Published by New York City-based Page Publishing, Anna Mack’s enjoyable tale is relatable to children and parents across the globe. Being the youngest member of the family is not easy. Norman Edward’s day starts out the same each morning with his juice ending up everywhere except the place it is intended—his cup. Despite Mother’s best efforts, she is cleaning up after his older siblings, Joseph and Louise, are sent off to catch the school bus. Such is the case, until one day, a simple act becomes the solution to Norman Edward’s and Mother’s dilemma. Readers who wish to experience this delightful work can purchase “Norman Edward's Juice Cup” at bookstores everywhere, or online at the Apple iTunes store, Amazon, Google Play or Barnes and Noble.